With the exception of the Battery Voltage Sensor and a couple of others, you'll need a sensor hub to connect most of these various devices to your receiver to get the telemetry data reported back on your transmitter. In order to read voltage, lipo voltage, current info from new Tanaris radio with XJT & X8R, you will need those sensors connect to a sensor hub then connect to a Variometer sensor which has smart-port to connect to X series products. If you have any questions about hooking these together, or which ones you need, just contact us. This is the sensor hub to which many other sensors (see below) can be connected. The hub is then connected to your 2-Way receiver (such as D8R series or D4R-II, etc.). 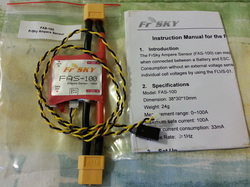 The FrSky Sensor Hub is recommended to connect to the digital side port (G, TX, RX) of your FrSky telemetry receiver and FrSky sensors by the provided cable, to serve as an information collecting and processing center, to monitor the model status and feed back all data to the FrSky Tx module. This uses a simple voltage divider circuit to measure the pack voltage on your aircraft. 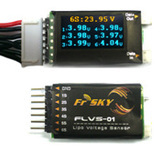 It can measure up to 5S LiPo as-is. You can also measure higher voltages, but you will need to modify the circuit to do so*. 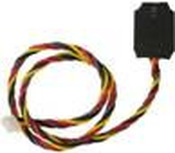 This plugs directly into a D8R or D4R-II* series receiver's voltage monitor port. Does NOT require Sensor Hub. Use this to measure the temperature of a battery, engine, etc. Up to two can be used at once. Beautiful OLED Color Display shows Li-Po cell voltages up to 6S. Up to 12S can be displayed by chaining two sensors together. Consumption (mAH) and Power (W) when connected between a Battery and ESC. Current (A) and Power (W) will be displayed on the FLD-02, while Current (A) and Power Consumption (mAH) will be displayed on the DHT-U. 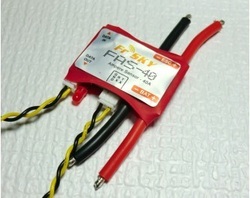 The FAS-40 reports Power and Power Consumption without an external voltage sensor and, in addition it can be chained together to report individual cell voltages by using the Lipo Voltage Sensor (FLVS-01). Current (A) and Power (W) will be displayed on the FLD-02, while Current (A) and Power Consumption (mAH) will be displayed on the DHT-U. 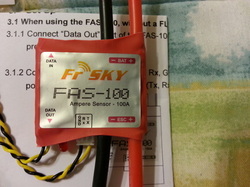 The FAS-100 reports Power and Power Consumption without an external voltage sensor and, in addition it can be chained together to report individual cell voltages by using the Lipo Voltage Sensor (FLVS-01). changes. Able to report altitude. When used with a FrSky transmitter like the Taranis, you can actually create mixes that use the feedback from the vario sensor. For example, you can have your motor reduce power when you reach a set altitude. An excellent feature for sites that have flight ceilings. Another nice feature of the vario is the ability to connect the FSH-01 sensor hub, thus allowing the X8R receiver's to use the existing analog sensors. 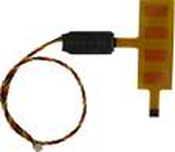 An optical RPM sensor. Point up through anything needing RPM measurement. Works only in daylight. Apply to the outside of your plastic fuel tank to measure fuel level from Empty, 1/4, 2/4, 3/4, to Full. Will not work on metal tanks or gasoline. The GPS sends back various data, such as speed, longitude and latitude.